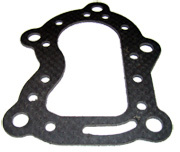 Our updated exhaust gasket is a direct replacement for the OEM #401145. It is more durable, and will withstand higher operating temperatures without failing. The superior quality often allows it to be re-used.